Every minute a life is snuffed out by someone who made the conscious choice to get behind the wheel and drive under the influence. That’s sixty lives an hour and one thousand four hundred and forty four lives a day. That’s insane. DUI: Driving Under the Influence is an issue, but one that continues to plague our society. These deaths are easily preventable. Yet every single day there’s the conscious choice made to get in a vehicle, turn a key and press the accelerator. When this occurs we’ve now entered a mobile version of Russian Roulette. Part of the issue is determining what is and isn’t deemed being under the influence. 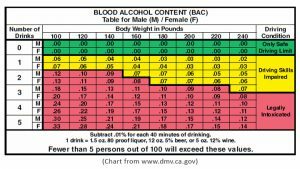 In the United States and the United Kingdom, .08 blood alcohol content is deemed as being under the influence of alcohol. Countries such as Poland and Norway are at a strong .02. For this particular post, we will focus solely on alcohol. What you should know, that being under the influence includes anything that impairs your ability to to drive. This included prescription pills, marijuana and over the counter medication. In regards to alcohol, almost any text book you can find will say that one drink per hour is fairly standard for your body to metabolize alcohol. What is not taken into consideration is the type and percentage of alcohol consumed. There is a difference between a shot of tequila, a glass of red wine and a beer. I’ve included a chart to break down the alcohol content of drinks. Another factor is height, weight, metabolism and whether the individual has any food in their system. There many factors to consider. Unfortunately one determining factor can often be if the individual feels effected. One other wrench to throw in this equation is tolerance. If you drink frequently, you may be a .08 but feel no real effect of what you have consumed. We live in a society that revolves around celebrating, mourning and congregating around alcohol. It’s a challenge for many to have fun without it being present. I’m not here to judge, but I believe the rampant nature of driving under the influence is a big issue. If you want to drink, go for it. You want to drink your face off, do your thing. You want to have a few beers and then shortly after hop behind the wheel? I have an issue with that. Here’s the thing, when you drive sober you are operating a motor vehicle. When you drive under the influence that vehicle now becomes a weapon. Every individual metabolizes and is affected by alcohol differently. If you are going to hit a bar or have drinks for dinner with friends I’ll encourage you to purchase a hand held breathalyzer. You can find one for under fifteen dollars on Amazon. How cool is that? My feeling is, at anything .04 and over is placing you in a unsettling zone. Arrange for a designated driver. Or in a day and age when you can order an Uber, Lyft or cab quicker than ordering a pizza there is no excuse to get behind the wheel if you are unsure. The risk is not worth it. In the past year I have overheard many young people discuss how common it is for their peers in college to have a dui. It comes across as almost common place. This is something I don’t understand. Parents, continue to dialogue with your children defining what dui is and its potential for disaster. There is a disconnect that needs to be realigned and reaffirmed. Have a voice and let it be heard…. I have a question for you. If you were out with friends or family and you witnessed someone who appeared intoxicated would you intervene? Would you speak up? We live in a, “it’s their decision and let’s not make waves” kind of world. I think that’s pathetic. I believe it’s spineless. What would it take for you to voice your concern? To get involved? Nineteen years ago this week a handful of individuals had that exact opportunity, to say something. Their mouthes stayed closed and their eyes turned away. The result of their silence was the death of my sister, Shana, and her three friends, Amanda, Angela and Megan. Four lives wiped off of the face of the earth because the drunk driver, Melissa Marvin, made the decision to drink, get behind the wheel and drive. She did not make an effort to stop. Her vehicle met their vehicle and the universe changed. I lost my best friend. What I want you to know is that Melissa was at numerous places from the bar to the time of the crash. She encountered more than one individual who witnessed her intoxicated. They remained silent; every single one of them. I believe these people are also culpable for the death of Shana, Amanda, Angela and Megan. Silence is not an option. My sister has now been gone longer than her time here on earth. As I sit here typing I hold back tears and feel an ache in my heart that will never subside. I miss her more than air itself. What I want you to know is that silence does not exempt us from guilt. Speak up, take keys and intervene. For those of you who have been out and questioned whether you are ok or not do drive I urge you to not play Russian Roulette. You may believe it’s only a few miles up the road to get home and that you’re not that bad off. What I’ll tell you is that two and a half miles from where my family once lived stand the four crosses that symbolize the life of my sister, Amanda, Ange and Meg. Playing Russian Roulette is bull crap, selfish and unacceptable. So as you head into your day I challenge you to think about your decisions and the ones around you. There are certain risks worth taking, this is not one of them. There are times when silence is ok, this is not that time. Know that you are fearfully and wonderfully made, but you are fragile and life is fleeting. Tell the ones around you that you love them. Never take them for granted. Never. I would do anything to have Shana here with me. As I sat on the beach with my little boy yesterday I could picture Shana sitting there with us. She would have adored him. Instead, he will know her only through pictures and stories. Love the ones you have desperately and deeply. Say, “I love you,” every single day. Let the trivial stuff go. Precious Gems Memorial was created following the crash as a way of educating and informing the public about the fragility of life and the power of good decision making. I encourage you to visit www.preciousgemsmemorial.com to read about our girls and the mission of our organization.